I’m finally back in London after a good 2 weeks off in Malaysia on vacation. It’s been a serious reality check returning to work after such a long break off. Apart from the usual barrage of e-mails to catch up on, it took the body a few days to get used to the change in scenery of food… from good ol’ Nasi Lemak and Ipoh Kuey Teow to Pret Sandwiches and EAT. soups. Boring staple work lunches aside, at least there’s the consolation of getting back out onto London’s food scene in search of more perfect dinners. And what better place to start than in the local neighbourhood. Cafe De Luxe (**recently renamed Cafe a Vin) is the Galvin Brothers’ latest addition to their already glowing resume which boasts Baker Street’s Bistrot de Luxe and the Michelin-starred Galvin at the Windows. I’m particularly glad they’ve chosen the good ol’ East End to grow their empire. Sited just beside Spitalfields market, their latest project is twice the fun with the more formal La Chapelle and less formal Cafe De Luxe sitting side by side to one another. The smaller Cafe aims to offer a more relaxed atmostphere relative to the decadence of its more upmarket sister next door. The sleek, contemporary interior does bring a touch of class to Spitalfields, however despite the floor to ceiling glass windows facing Bishop’s square, I couldn’t help but feel a little claustro-phobic – a side effect of packing too many patrons on much-too small dining tables. 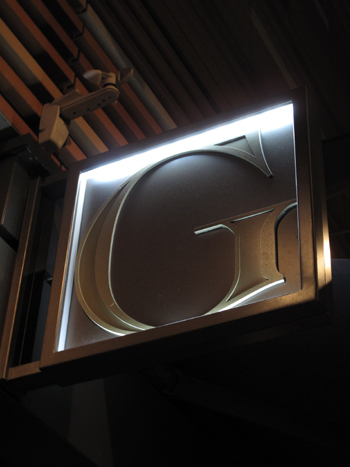 Absolutely no complaints about the food though… It was trademark-Galvin French fare at its very best – great produce prepared with precision and care. 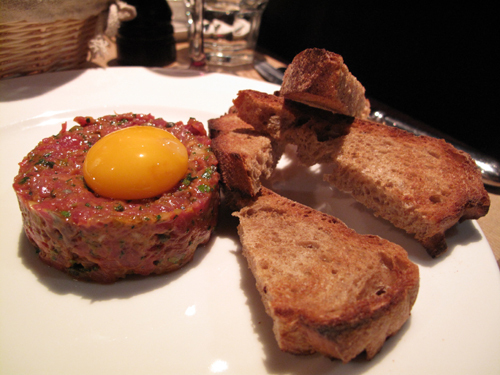 I could sing praises about their Steak Tartare all day long. It’s easily one of the best I’ve ever tasted and could rival any top-notch Parisian bistro in my view. The ground up fillet steak was velvety smooth, moist, and oh-so-tender… the characteristic worcester-mustard-piquancy balanced out perfectly by the richness from the egg-yolk and freshness of the herbs. I get the feeling this is one dish I’m going to come back for again and again. 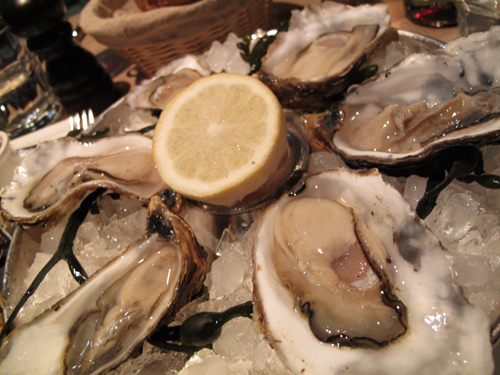 Given they had run out of fish soup for the day, Jo had to opt for the Oysters with Shallot Vinaigrette instead to quell her seafood craving. I’m usually not a fan of oysters at all, but it was hard to stop salivating when they brought out these whopppingly large beauties. Judging from the slurps of contentment from opposite me, I can only assume they tasted as fresh out of the sea as they looked. The quality continued through to the main courses. 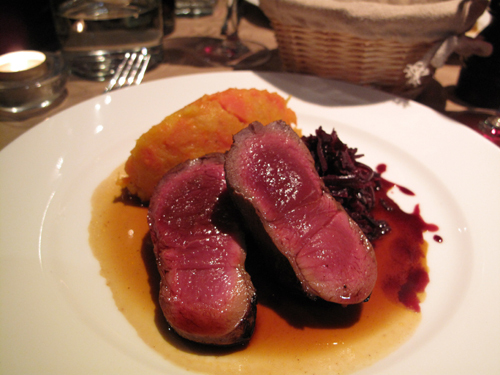 My Venison haunch was cooked beautifully… seared with a caramelised glaze on the outside while still pink in the middle. The sweetness from the root vegetable mash and sharp piquancy of the braised cabbage complemented the venison wonderfully, seemingly intensifying the robust, gamey flavour of the meat. The hake too was faultless in taste and execution – the flesh of the fish was flaky and moist and the skin kept immaculately crisp. 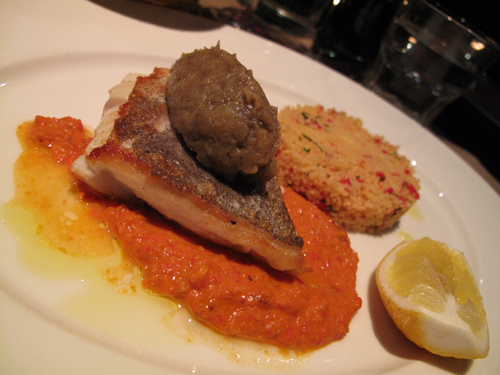 The rich red-pepper based Romesco sauce was delicious and along with the cous-cous gave the dish a real Mediterranean twist. Perhaps the dish was somewhat let down in the presentation stakes. Call me picky, but there’s something incredibly clumsy and unappetizing about that grey lump of aubergine caviar on the top… In any case, definitely a dish which tasted better than it looked. 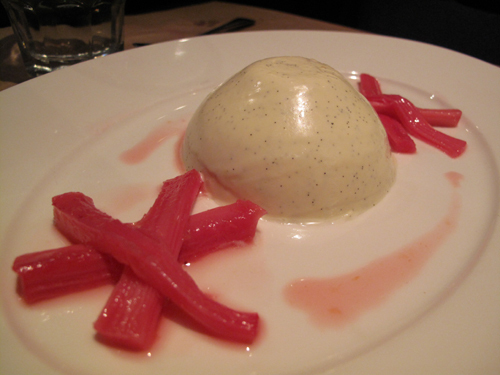 A simple, no-nonsense Panna Cotta, packed full of fresh vanilla pods rounded up a very good meal indeed. With a nice 475ml pot nice Pinot Noir thrown in the mix, it was well worth every penny of the 70 quid total bill for 2. I’ll certainly be going back for the Steak Tartare and will beg them to consider the option of super-sizing it into a Main Course portion.